Hypnosis is a natural state, one that we experience daily. So, while people are often wary of hypnosis, thinking that it is an altered state and one is out of control, quite the opposite is true. You are in control, in fact it it is an intense state of focus. Driving a familiar route to work is a common example of operating on autopilot, without thinking about it. Although heart rate and respiration may slow down, this is due to the relaxation involved in the “induction”process,often used progressive relaxation. Those symptoms are not the hypnotic state itself. Research into the hypnotic state has shown that there are different brainwave levels that are involved. An alert state is called Beta. It is the state one is in when learning a new skill. It is the normal wakening state. Alpha is a relaxed state, where individuals access creative thoughts and visualization. 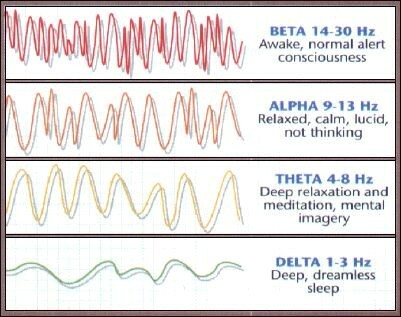 Theta is deeper relaxed, often associated with meditation and deep hypnosis. It is the state one goes through as they fall asleep or awaken in the morning. It is easier to access memories in Theta. Once asleep the brainwaves are Delta. Most of the work done in clinical hypnosis is during the alpha brainwaves. Often stage hypnosis uses the demand “SLEEP!” So people expect to actually go to sleep. While the individual may be relaxed, they are not asleep. One often hears everything going on around them, it just doesn’t matter. The conscious mind continues to check the environment. The analytical mind will try to determine if “this” is working. Thoughts may wander to another subject during the process. That is all natural, so it is best to just relax, enjoy and allow the process. So, as you can see, hypnosis is a natural state of being. It is safe and non-intrusive. As I am fond of saying to my clients, hypnosis is so natural and easy, you can do it with your eyes closed.